We’ve all been there—hands occupied with dishes, bags of groceries, or baskets of laundry. Then the doorbell rings. Or you need more light in the kitchen. Or you want to skip ahead to a new song on your Spotify playlist. It's in these moments when you could use a quick helping hand. Wouldn't it be great to simply tell your home to handle the task and have it carry out your wishes? Thanks to the availability of a wide variety of voice-controllable devices, controlling your home completely hands-free is entirely possible. It’s not only possible; it’s becoming increasingly popular, with voice assistant technologies like Amazon Alexa marking the genesis of the voice control craze. According to OC&C Strategy Consultants, 13 percent of all households in the United States owned a smart speaker in 2017. This number is predicted to rise to 55 percent by 2022. Products like Amazon Echo and Google Home aren’t just a novelty that wears off, either. Per Google, seventy-two percent of people who own voice-activated speakers say that their devices are used as part of their daily routines. Able to hear, understand, and execute verbal edicts, smart speakers have offered up a new way to retrieve music, weather reports, and other information without needing to tap buttons on a smartphone or tablet. The hands-free nature of this interaction is the main reason homeowners have adopted smart speakers, cited by 55 percent of respondents in a study by Pew Research. Other people (23 percent) said they use voice assistants because they are fun, because speaker to the assistant feels more natural than typing (22 percent), or because these programs are easier for children to use (14 percent). Based on statistics like these, it's clear that voice control is growing in demand. 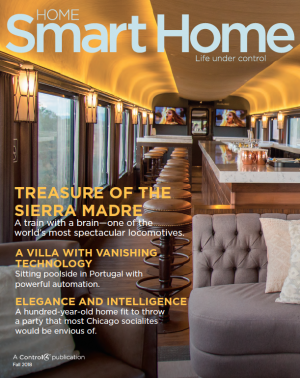 It hasn't taken long for manufacturers to engineer solutions that would allow these information-gathering smart speakers to also be used as conduits for sending voice commands to light switches, thermostats, whole-house music systems, electronic door locks, and more. An utterance of “Alexa, turn on the kitchen lights,” is all it takes to illuminate the space as you walk in with an armload of groceries, for example. You can still use smart speakers to usher commands to a variety of voice-enabled devices in the home. However, many manufacturers have removed speakers from the communications loop by embedding voice assistant technology directly into the devices. The light switch, thermostat, or music system hears you all on its own and is able to respond appropriately. The pinnacle of voice control in the home, however, is when one spoken phrase can control multiple devices at once. This happens when a voice-enabled home control system like one from Control4 is put in charge. It can interpret a command like, “Alexa, turn on dinner party" that queues up a special playlist, turns on lights in specfic areas, closes the shades, and unlocks the front door. And what better way to keep your guests comfortable and entertained when you can dim the lights, raise the volume of the music, and kick-start the gas fireplace without leaving the room, much less lifting a finger…unless you want to, of course. 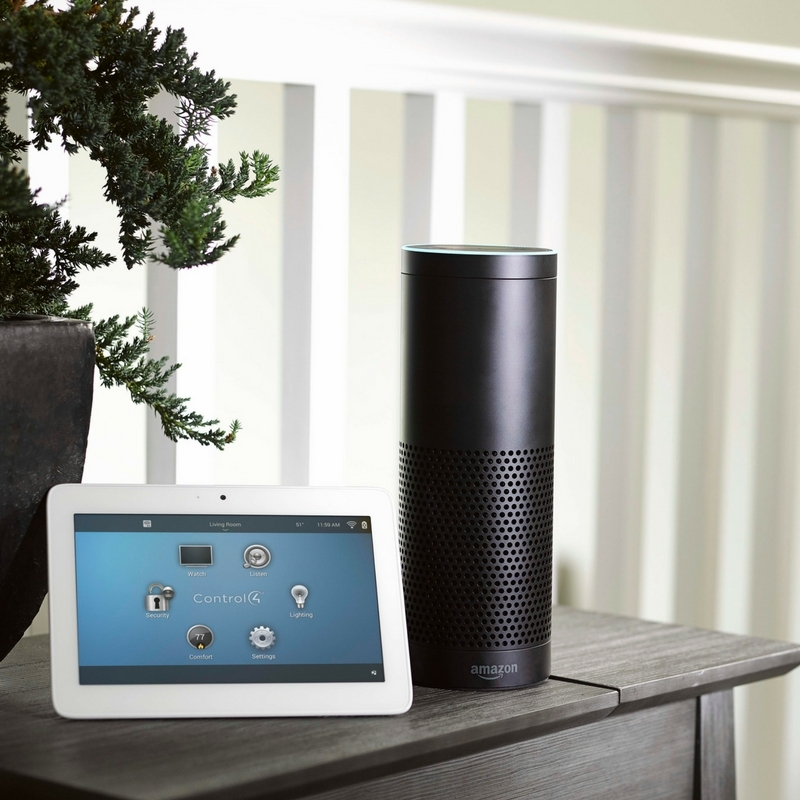 Despite all of its appeal, voice control isn’t the end-all-be-all of a smart home lifestyle. There are still many occasions when using a keypad, touch screen, remote, or smartphone makes more sense—like when you’d like to monitor surveillance cameras or view a list of songs in your music library. Voice control simply adds another useful method of control to your smart home. It’s easy, fun, increasingly reliable … and lets you keep your hands to yourself.